It is our view that you can do research on the web to help get informed. But in the end you do have to trust your own knowledge and intuition. And of course your own experience. Look up a topic you know a lot about on the web. How much misinformation do you see? Plenty, I’ll bet. So don’t just accept whatever somebody has on their site. In the water filter field, there are lots of sites that provide at least some bad information. Nobody is perfect and can make occasional mistakes. But if you see statements like “Only reverse osmosis filters remove fluoride.” then you are looking at a site run by people that are either deliberately misinforming you, or more likely are just repeating something that they read on another site and made no effort to learn the truth themselves. 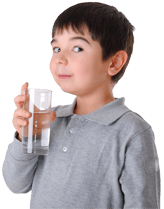 When the Water Quality Association reports activated alumina as the best way to filter fluoride, how can people continue to provide such blatantly inaccurate info? Similarly, there are sites that state categorically that there are no shower filters that reduce chloramine. If you ask them about the shower filters that we sell, we imagine that they will tell you that they simply could not reduce chloramine – there just isn’t enough filter material. But ask them if they know about the patented process whereby the kdf in the filters is improved – and ask them if they have actually tested these shower filters – and they will have to admit that they don’t actually have any knowledge of these filters or the patented process that makes less filter material more effective. We’ve even heard people doubt their own experience of having better shower water, and healthier hair, skin and other health issues after using one of these filters – because they read something saying there aren’t shower filters that remove chloramine! Wow – that’s extreme: not trusting your own experience because of something you read. However, nearly everyone who tries these is delighted because they are aware of the considerable improvement in their water. We may actually have even saved lives with the chloramine-removal filters. One Houston-area customer who had his chloramine problems solved with a whole house filter from us – told us his neighbor got in the shower and died. We find regional pool suppliers are another frequent source of misinformation. We sell natural pool filters that keep you water clean without the addition of disinfectants. This is of course great for your health. But there are lots of local pool suppliers (who coincidentally sell chlorine and other chemicals) who will swear that these filters won’t work. They cannot however, actually have had any experience with these filters – because quite simply, they work very well! In several years of selling these natural pool filters, we’ve had only two customers who weren’t satisfied with them. But we’ve know of a number of people who felt so pressured that they caved in and continue to use unneeded chemicals. If you are buying something, ask yourself if these are people you want to do business with. Websites are made by people. Does the website you are looking at project what you look for in a vendor?